This is one of the plant genera with the greatest number of species in the world. Species are thought to be more than a thousand, and new ones are constantly being formed. How do new species come about? Hawthorns cross-breed easily between themselves and produce plants that are difficult to identify and may have characteristics intermediate between the species. In Estonia hawthorns usually grow as tall shrubs, more seldom as low trees. More than sixty species are cultivated in parks and gardens; the best known of them is the Quebec hawthorn (Craetagus submollis). In western Estonia some ten species are indigenous; habitats are forest clearings, forest verges, alvars or, on the islands, land strips along the stone walls. Some have evolved and spread only in Estonia and are unique. Two such are the Saaremaa hawthorn (Crataegus ×osiliensis) and the Viidumäe hawthorn (Crataegus ×viidumaegica). 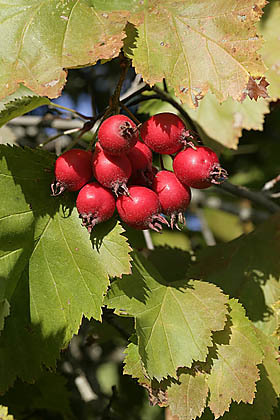 The Crataegus rhipidophylla is the most common, with ripe fruits now. The so-called pomes are big, with a mealy taste. The ripe fruits are quite nice to eat in spite of the large seeds. In the old days people called them "mealy berries“ and the hawthorn, the mealy berry tree.